The Dream Cutter’s multi-functional approach is ambitious, however diligent engineering and manufacturing craftsmanship has resulted a highly refined and capable product. The convergence of these functions also permits the Dream Cutter to perform Compound Radial Cutting ™ Compound Radial Cutting (patents pending) is a new lathe turning technique where the cutting tool is swept simultaneously or independently in sub-ordinate radii arcs where the tangent to the work axis is controlled by an over-arching primary radius arc. Compound Radial Cutting is applied with the Dream Cutter to maintain radial tool path continuity, improve material removal rates, and reduce surface finish waviness. Recognizing rigidity is vital to the tool’s effectiveness; structural integrity was an unwavering focus in the Mini-Lathe Dream Cutter’s development. The result of this focus is a tool which maintains the highest possible degree of precision while demonstrating the full range of its capabilities. The Mini-Lathe Dream Cutter is installed using a mounting plate which fastens to the cross slide saddle in place of a compound rest. Approximately ½” in height, the mounted body of the Mini-Lathe Dream Cutter is low enough to pass under a 3” lathe chuck. 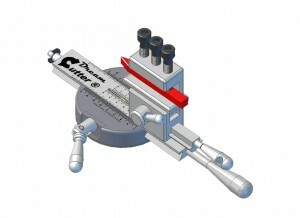 The Dream Cutter’s controls can be configured in either in direction on the rail re-orient the tool post mount. The multiple configurations of the Mini-Lathe Dream Cutter allow for up to a 3” diameter sphere to be cut and perform tapers at any angles in either direction. The Mini-Lathe Dream Cutter includes a feature-packed tool holder that’s fully adjustable to accommodate a wide variety of tools. Hobbyist, craftsman, artisan and industrial machinists will appreciate all the ways in which the Mini-Lathe Dream Cutter™ breaches barriers to creativity. Operators of small bench top lathes such at those offered by Proxxon® , Schaublin® , Seig® , Sherline® , Taig® , Wabeco® and others will discover the combined the features of the Mini-Lathe Dream Cutter can speed most cutting operations, allowing for complex turned pieces to be created with minimal interruption to cutting operations. Availability and pricing to be announced August 2010. ToolMasters, thank you for your inquiry.